The Verdict: I had extremely high hopes for the chicken parmigiana at the Stones Corner Hotel after receiving some pretty good wraps for it in advance of the parma test. It would be fair to say two things: first, there is great potential in the Stones Corner Hotel chicken parmigiana BUT second, in order for that potential to be reached the ham / sauce / cheese elements have to stay under the grill for longer. Chicken: I really enjoyed the chicken piece on this meal. It was well cooked and well crumbed. It was the hero of this dish. Tomato Sauce: This is where it started to become obvious this chicken parmigiana had been under grilled. The sauce was cold. Gazpacho on a chicken piece is how I would describe it and it was not good. 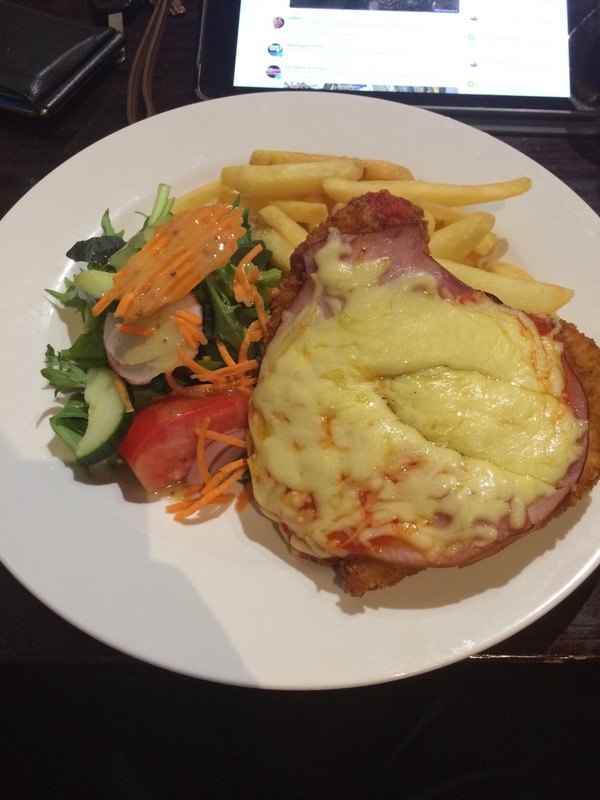 Ham: The ham on the Stones Corner Hotel chicken parma was really good save, again, it suffered from not being under the grill for long enough. It covered the chicken piece well and tasted great. Cheese: Keeping with the theme of this review the cheese was obviously under grilled and under melted. Nothing more needed to be said really. Side Dishes: Where some of the key elements of the chicken aspect of this dish were under cooked, the chips on this dish were cooked very well and tasted great. My only criticism of the chips would be that they needed some salt. The salad was well put together and well dressed. Presentation: The presentation of this chicken parmigiana was a little strange in the sense that the plate was massive and the elements of the dish were all stacked on top of each other. The chicken piece was resting on both the salad and the chips. The Venue: The Stones Corner Hotel is located on Logan Road in Stones Corner. It has been recently renovated and is another of those pubs in Brisbane that now offers only craft beer on tap. It has a full schedule of events including trivia and comedy nights. My parma was a little expensive at $22. The Final Word: This offering in the quest to find Brisbane’s Best Parma had significant potential but was let down by the execution. If it had have been under the grill for a bit longer it would have been really good but as it was some of the key elements were presented cold and under done. This entry was posted in Uncategorized and tagged Brisbane, brisbane eats, brisbane food, chicken, chicken parmigiana, stones corner hotel. Bookmark the permalink. 1 Response to Parma Number 42: Stones Corner Hotel … Gazpacho on chicken does not for a good meal make! Chips not being salted could be two things. 1. They forgot. 2. Leave it to the customer to salt to flavour in this health conscious time we live in. Not sure why they would do that for a CP dish, but is a possibility. IMHO though, nothing tastes as good as chips that are salted just after getting dragged from the fryer. Adding salt later doesn’t quite do it for me.